Doris J. Neumann was born on July 14, 1932, in Chicago, Illinois to Rawson and Naomi (nee Wesley) Dickinson. 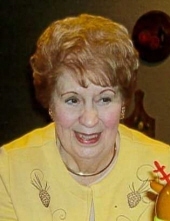 She died Saturday, October 20, 2018, at Northwest Community Hospital - JourneyCare Hospice, Arlington Heights. Before retiring Mrs. Neumann was a buyer for Persin and Robbins Jewelers in Arlington Heights. She was a member of St. Peter Lutheran Church. She was preceded in death by her husband Robert Neumann; her parents; and her brother, Rawson Lee Dickinson. Visitation from 4:00 pm until 7:00 pm, Wednesday, October 24, 2018, at Glueckert Funeral Home Ltd., 1520 North Arlington Heights Road, Arlington Heights, Illinois. Funeral Service 10:00 am, Thursday, October 25, 2018, at Glueckert Funeral Home, Ltd., 1520 North Arlington Heights Road, Arlington Heights, Illinois. Interment Memory Gardens, Arlington Heights, Illinois. In lieu of flowers, memorials may be given to the American Cancer Society, P.O. Box 22718, Oklahoma City, OK 73123-1718. "Email Address" would like to share the life celebration of Doris Jane Neumann. Click on the "link" to go to share a favorite memory or leave a condolence message for the family.